Mattar Pulao recipe by Nazia at PakiRecipes.com. Heat oil, fry sliced onion until it gets brown, add whole spices, both the zeera , ginger / garlic and fry the mixture. 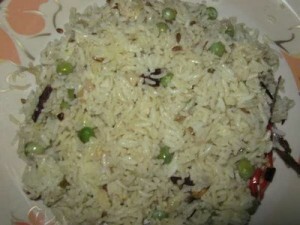 Then add curd and fry well, add peas, rice, whole green chillies and enough water for rice. Cover and let it cook then leave on dam for 10 min.